For other uses of "Color" and "Colour", see Color (disambiguation). For editing Wikipedia, see Help:Using color. See also, Colorful (disambiguation) and Lists of colors. Color (American English), or colour (Commonwealth English), is the characteristic of human visual perception described through color categories, with names such as red, orange, yellow, green, blue, or purple. This perception of color derives from the stimulation of cone cells in the human eye by electromagnetic radiation in the visible spectrum. Color categories and physical specifications of color are associated with objects through the wavelength of the light that is reflected from them. This reflection is governed by the object's physical properties such as light absorption, emission spectra, etc. By defining a color space, colors can be identified numerically by coordinates, which in 1931 were also named in global agreement with internationally agreed color names like mentioned above (red, orange, etc.) by the International Commission on Illumination. 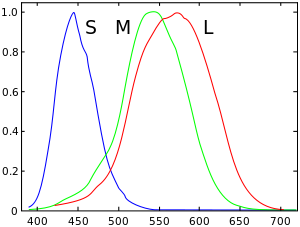 The RGB color space for instance is a color space corresponding to human trichromacy and to the three cone cell types that respond to three bands of light: long wavelengths, peaking near 564–580 nm (red); medium-wavelength, peaking near 534–545 nm (green); and short-wavelength light, near 420–440 nm (blue). 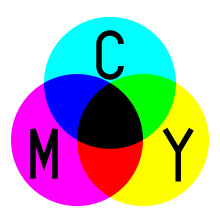 There may also be more than three color dimensions in other color spaces, such as in the CMYK color model, wherein one of the dimensions relates to a color's colorfulness). The photo-receptivity of the "eyes" of other species also varies considerably from that of humans and so results in correspondingly different color perceptions that cannot readily be compared to one another. Honeybees and bumblebees for instance have trichromatic color vision sensitive to ultraviolet but is insensitive to red. Papilio butterflies possess six types of photoreceptors and may have pentachromatic vision. The most complex color vision system in the animal kingdom has been found in stomatopods (such as the mantis shrimp) with up to 12 spectral receptor types thought to work as multiple dichromatic units. The science of color is sometimes called chromatics, colorimetry, or simply color science. It includes the study of the perception of color by the human eye and brain, the origin of color in materials, color theory in art, and the physics of electromagnetic radiation in the visible range (that is, what is commonly referred to simply as light). 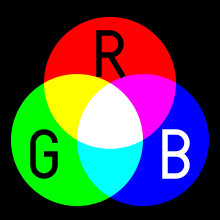 Continuous optical spectrum rendered into the sRGB color space. Electromagnetic radiation is characterized by its wavelength (or frequency) and its intensity. When the wavelength is within the visible spectrum (the range of wavelengths humans can perceive, approximately from 390 nm to 700 nm), it is known as "visible light". Most light sources emit light at many different wavelengths; a source's spectrum is a distribution giving its intensity at each wavelength. Although the spectrum of light arriving at the eye from a given direction determines the color sensation in that direction, there are many more possible spectral combinations than color sensations. In fact, one may formally define a color as a class of spectra that give rise to the same color sensation, although such classes would vary widely among different species, and to a lesser extent among individuals within the same species. In each such class the members are called metamers of the color in question. The familiar colors of the rainbow in the spectrum—named using the Latin word for appearance or apparition by Isaac Newton in 1671—include all those colors that can be produced by visible light of a single wavelength only, the pure spectral or monochromatic colors. The table at right shows approximate frequencies (in terahertz) and wavelengths (in nanometers) for various pure spectral colors. The wavelengths listed are as measured in air or vacuum (see refractive index). The color table should not be interpreted as a definitive list—the pure spectral colors form a continuous spectrum, and how it is divided into distinct colors linguistically is a matter of culture and historical contingency (although people everywhere have been shown to perceive colors in the same way). A common list identifies six main bands: red, orange, yellow, green, blue, and violet. Newton's conception included a seventh color, indigo, between blue and violet. It is possible that what Newton referred to as blue is nearer to what today is known as cyan, and that indigo was simply the dark blue of the indigo dye that was being imported at the time. The intensity of a spectral color, relative to the context in which it is viewed, may alter its perception considerably; for example, a low-intensity orange-yellow is brown, and a low-intensity yellow-green is olive green. The color of an object depends on both the physics of the object in its environment and the characteristics of the perceiving eye and brain. Physically, objects can be said to have the color of the light leaving their surfaces, which normally depends on the spectrum of the incident illumination and the reflectance properties of the surface, as well as potentially on the angles of illumination and viewing. Some objects not only reflect light, but also transmit light or emit light themselves, which also contributes to the color. A viewer's perception of the object's color depends not only on the spectrum of the light leaving its surface, but also on a host of contextual cues, so that color differences between objects can be discerned mostly independent of the lighting spectrum, viewing angle, etc. This effect is known as color constancy. 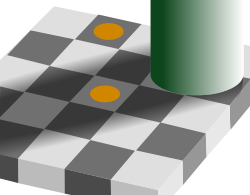 The upper disk and the lower disk have exactly the same objective color, and are in identical gray surroundings; based on context differences, humans perceive the squares as having different reflectances, and may interpret the colors as different color categories; see checker shadow illusion. Light arriving at an opaque surface is either reflected "specularly" (that is, in the manner of a mirror), scattered (that is, reflected with diffuse scattering), or absorbed – or some combination of these. Opaque objects that do not reflect specularly (which tend to have rough surfaces) have their color determined by which wavelengths of light they scatter strongly (with the light that is not scattered being absorbed). If objects scatter all wavelengths with roughly equal strength, they appear white. If they absorb all wavelengths, they appear black. Opaque objects that specularly reflect light of different wavelengths with different efficiencies look like mirrors tinted with colors determined by those differences. An object that reflects some fraction of impinging light and absorbs the rest may look black but also be faintly reflective; examples are black objects coated with layers of enamel or lacquer. Objects that transmit light are either translucent (scattering the transmitted light) or transparent (not scattering the transmitted light). If they also absorb (or reflect) light of various wavelengths differentially, they appear tinted with a color determined by the nature of that absorption (or that reflectance). Objects may emit light that they generate from having excited electrons, rather than merely reflecting or transmitting light. The electrons may be excited due to elevated temperature (incandescence), as a result of chemical reactions (chemoluminescence), after absorbing light of other frequencies ("fluorescence" or "phosphorescence") or from electrical contacts as in light emitting diodes, or other light sources. To summarize, the color of an object is a complex result of its surface properties, its transmission properties, and its emission properties, all of which contribute to the mix of wavelengths in the light leaving the surface of the object. The perceived color is then further conditioned by the nature of the ambient illumination, and by the color properties of other objects nearby, and via other characteristics of the perceiving eye and brain. When viewed in full size, this image contains about 16 million pixels, each corresponding to a different color on the full set of RGB colors. The human eye can distinguish about 10 million different colors. The ability of the human eye to distinguish colors is based upon the varying sensitivity of different cells in the retina to light of different wavelengths. Humans are trichromatic—the retina contains three types of color receptor cells, or cones. One type, relatively distinct from the other two, is most responsive to light that is perceived as blue or blue-violet, with wavelengths around 450 nm; cones of this type are sometimes called short-wavelength cones, S cones, or blue cones. The other two types are closely related genetically and chemically: middle-wavelength cones, M cones, or green cones are most sensitive to light perceived as green, with wavelengths around 540 nm, while the long-wavelength cones, L cones, or red cones, are most sensitive to light is perceived as greenish yellow, with wavelengths around 570 nm. Light, no matter how complex its composition of wavelengths, is reduced to three color components by the eye. Each cone type adheres to the principle of univariance, which is that each cone's output is determined by the amount of light that falls on it over all wavelengths. For each location in the visual field, the three types of cones yield three signals based on the extent to which each is stimulated. These amounts of stimulation are sometimes called tristimulus values. The response curve as a function of wavelength varies for each type of cone. Because the curves overlap, some tristimulus values do not occur for any incoming light combination. For example, it is not possible to stimulate only the mid-wavelength (so-called "green") cones; the other cones will inevitably be stimulated to some degree at the same time. The set of all possible tristimulus values determines the human color space. It has been estimated that humans can distinguish roughly 10 million different colors. The other type of light-sensitive cell in the eye, the rod, has a different response curve. In normal situations, when light is bright enough to strongly stimulate the cones, rods play virtually no role in vision at all. On the other hand, in dim light, the cones are understimulated leaving only the signal from the rods, resulting in a colorless response. (Furthermore, the rods are barely sensitive to light in the "red" range.) In certain conditions of intermediate illumination, the rod response and a weak cone response can together result in color discriminations not accounted for by cone responses alone. These effects, combined, are summarized also in the Kruithof curve, that describes the change of color perception and pleasingness of light as function of temperature and intensity. The visual dorsal stream (green) and ventral stream (purple) are shown. The ventral stream is responsible for color perception. While the mechanisms of color vision at the level of the retina are well-described in terms of tristimulus values, color processing after that point is organized differently. A dominant theory of color vision proposes that color information is transmitted out of the eye by three opponent processes, or opponent channels, each constructed from the raw output of the cones: a red–green channel, a blue–yellow channel, and a black–white "luminance" channel. This theory has been supported by neurobiology, and accounts for the structure of our subjective color experience. Specifically, it explains why humans cannot perceive a "reddish green" or "yellowish blue", and it predicts the color wheel: it is the collection of colors for which at least one of the two color channels measures a value at one of its extremes. The exact nature of color perception beyond the processing already described, and indeed the status of color as a feature of the perceived world or rather as a feature of our perception of the world—a type of qualia—is a matter of complex and continuing philosophical dispute. While most humans are trichromatic (having three types of color receptors), many animals, known as tetrachromats, have four types. These include some species of spiders, most marsupials, birds, reptiles, and many species of fish. Other species are sensitive to only two axes of color or do not perceive color at all; these are called dichromats and monochromats respectively. A distinction is made between retinal tetrachromacy (having four pigments in cone cells in the retina, compared to three in trichromats) and functional tetrachromacy (having the ability to make enhanced color discriminations based on that retinal difference). As many as half of all women are retinal tetrachromats. :p.256 The phenomenon arises when an individual receives two slightly different copies of the gene for either the medium- or long-wavelength cones, which are carried on the X chromosome. To have two different genes, a person must have two X chromosomes, which is why the phenomenon only occurs in women. There is one scholarly report that confirms the existence of a functional tetrachromat. When an artist uses a limited color palette, the eye tends to compensate by seeing any gray or neutral color as the color which is missing from the color wheel. For example, in a limited palette consisting of red, yellow, black, and white, a mixture of yellow and black will appear as a variety of green, a mixture of red and black will appear as a variety of purple, and pure gray will appear bluish. The trichromatic theory is strictly true when the visual system is in a fixed state of adaptation. In reality, the visual system is constantly adapting to changes in the environment and compares the various colors in a scene to reduce the effects of the illumination. If a scene is illuminated with one light, and then with another, as long as the difference between the light sources stays within a reasonable range, the colors in the scene appear relatively constant to us. This was studied by Edwin Land in the 1970s and led to his retinex theory of color constancy. Both phenomena are readily explained and mathematically modeled with modern theories of chromatic adaptation and color appearance (e.g. CIECAM02, iCAM). There is no need to dismiss the trichromatic theory of vision, but rather it can be enhanced with an understanding of how the visual system adapts to changes in the viewing environment. The CIE 1931 color space chromaticity diagram. The outer curved boundary is the spectral (or monochromatic) locus, with wavelengths shown in nanometers. The colors depicted depend on the color space of the device on which you are viewing the image, and therefore may not be a strictly accurate representation of the color at a particular position, and especially not for monochromatic colors. Most light sources are mixtures of various wavelengths of light. Many such sources can still effectively produce a spectral color, as the eye cannot distinguish them from single-wavelength sources. For example, most computer displays reproduce the spectral color orange as a combination of red and green light; it appears orange because the red and green are mixed in the right proportions to allow the eye's cones to respond the way they do to the spectral color orange. Another problem with color reproduction systems is connected with the acquisition devices, like cameras or scanners. The characteristics of the color sensors in the devices are often very far from the characteristics of the receptors in the human eye. In effect, acquisition of colors can be relatively poor if they have special, often very "jagged", spectra caused for example by unusual lighting of the photographed scene. A color reproduction system "tuned" to a human with normal color vision may give very inaccurate results for other observers. Additive color mixing: combining red and green yields yellow; combining all three primary colors together yields white. Additive color is light created by mixing together light of two or more different colors. Red, green, and blue are the additive primary colors normally used in additive color systems such as projectors and computer terminals. Subtractive coloring uses dyes, inks, pigments, or filters to absorb some wavelengths of light and not others. The color that a surface displays comes from the parts of the visible spectrum that are not absorbed and therefore remain visible. Without pigments or dye, fabric fibers, paint base and paper are usually made of particles that scatter white light (all colors) well in all directions. When a pigment or ink is added, wavelengths are absorbed or "subtracted" from white light, so light of another color reaches the eye. If the light is not a pure white source (the case of nearly all forms of artificial lighting), the resulting spectrum will appear a slightly different color. Red paint, viewed under blue light, may appear black. Red paint is red because it scatters only the red components of the spectrum. If red paint is illuminated by blue light, it will be absorbed by the red paint, creating the appearance of a black object. Structural colors are colors caused by interference effects rather than by pigments. Color effects are produced when a material is scored with fine parallel lines, formed of one or more parallel thin layers, or otherwise composed of microstructures on the scale of the color's wavelength. If the microstructures are spaced randomly, light of shorter wavelengths will be scattered preferentially to produce Tyndall effect colors: the blue of the sky (Rayleigh scattering, caused by structures much smaller than the wavelength of light, in this case air molecules), the luster of opals, and the blue of human irises. If the microstructures are aligned in arrays, for example the array of pits in a CD, they behave as a diffraction grating: the grating reflects different wavelengths in different directions due to interference phenomena, separating mixed "white" light into light of different wavelengths. If the structure is one or more thin layers then it will reflect some wavelengths and transmit others, depending on the layers' thickness. Structural color is studied in the field of thin-film optics. The most ordered or the most changeable structural colors are iridescent. Structural color is responsible for the blues and greens of the feathers of many birds (the blue jay, for example), as well as certain butterfly wings and beetle shells. Variations in the pattern's spacing often give rise to an iridescent effect, as seen in peacock feathers, soap bubbles, films of oil, and mother of pearl, because the reflected color depends upon the viewing angle. Numerous scientists have carried out research in butterfly wings and beetle shells, including Isaac Newton and Robert Hooke. Since 1942, electron micrography has been used, advancing the development of products that exploit structural color, such as "photonic" cosmetics. Color wheel: an illustrative organization of color hues in a circle that shows relationships. Colorfulness, chroma, purity, or saturation: how "intense" or "concentrated" a color is. Technical definitions distinguish between colorfulness, chroma, and saturation as distinct perceptual attributes and include purity as a physical quantity. These terms, and others related to light and color are internationally agreed upon and published in the CIE Lighting Vocabulary. More readily available texts on colorimetry also define and explain these terms. Dichromatism: a phenomenon where the hue is dependent on concentration and thickness of the absorbing substance. Hue: the color's direction from white, for example in a color wheel or chromaticity diagram. Shade: a color made darker by adding black. Tint: a color made lighter by adding white. Value, brightness, lightness, or luminosity: how light or dark a color is. ^ Wyszecki, Günther; Stiles, W.S. (1982). Colour Science: Concepts and Methods, Quantitative Data and Formulae (2nd ed.). New York: Wiley Series in Pure and Applied Optics. ISBN 978-0-471-02106-3. ^ R.W.G. Hunt (2004). The Reproduction of Colour (6th ed.). Chichester UK: Wiley–IS&T Series in Imaging Science and Technology. pp. 11–12. ISBN 978-0-470-02425-6. ^ Arikawa K (November 2003). "Spectral organization of the eye of a butterfly, Papilio". J. Comp. Physiol. A. 189 (11): 791–800. doi:10.1007/s00359-003-0454-7. PMID 14520495. ^ Cronin TW, Marshall NJ (1989). "A retina with at least ten spectral types of photoreceptors in a mantis shrimp". Nature. 339 (6220): 137–40. Bibcode:1989Natur.339..137C. doi:10.1038/339137a0. ^ Craig F. Bohren (2006). Fundamentals of Atmospheric Radiation: An Introduction with 400 Problems. Wiley-VCH. p. 214. Bibcode:2006fari.book.....B. ISBN 978-3-527-40503-9. ^ Waldman, Gary (2002). Introduction to light : the physics of light, vision, and color. Mineola: Dover Publications. p. 193. ISBN 978-0-486-42118-6. ^ Pastoureau, Michael (2008). Black: The History of a Color. Princeton University Press. p. 216. ISBN 978-0691139302. ^ a b Judd, Deane B.; Wyszecki, Günter (1975). Color in Business, Science and Industry. Wiley Series in Pure and Applied Optics (third ed.). New York: Wiley-Interscience. p. 388. ISBN 978-0-471-45212-6. ^ "Under well-lit viewing conditions (photopic vision), cones ...are highly active and rods are inactive." Hirakawa, K.; Parks, T.W. (2005). Chromatic Adaptation and White-Balance Problem (PDF). IEEE ICIP. doi:10.1109/ICIP.2005.1530559. Archived from the original (PDF) on November 28, 2006. ^ a b Jameson, K.A. ; Highnote, S.M. ; Wasserman, L.M. (2001). "Richer color experience in observers with multiple photopigment opsin genes" (PDF). Psychonomic Bulletin and Review. 8 (2): 244–61. doi:10.3758/BF03196159. PMID 11495112. ^ Jordan, G.; Deeb, S.S.; Bosten, J.M. ; Mollon, J.D. (20 July 2010). "The dimensionality of color vision in carriers of anomalous trichromacy". Journal of Vision. 10 (8): 12. doi:10.1167/10.8.12. PMID 20884587. ^ Depauw, Robert C. "United States Patent". Retrieved 20 March 2011. ^ a b M.D. Fairchild, Color Appearance Models Archived May 5, 2011, at the Wayback Machine, 2nd Ed., Wiley, Chichester (2005). ^ "Chart: Color Meanings by Culture". Archived from the original on 2010-10-12. Retrieved 2010-06-29. ^ Gnambs, Timo; Appel, Markus; Batinic, Bernad (2010). "Color red in web-based knowledge testing". Computers in Human Behavior. 26 (6): 1625–31. doi:10.1016/j.chb.2010.06.010. ^ "Economic and Social Research Council – Science in the Dock, Art in the Stocks". Archived from the original on November 2, 2007. Retrieved 2007-10-07. ^ R.S. Berns, Principles of Color Technology Archived 2012-01-05 at the Wayback Machine, 3rd Ed., Wiley, New York (2001). Maund, Barry. "Color". In Zalta, Edward N. (ed.). Stanford Encyclopedia of Philosophy. "Color". Internet Encyclopedia of Philosophy.